Siskoid's Blog of Geekery: Dating Lucy Lane: Are You Man Enough? Oh Lucy, you're going to make Jimmy self-conscious. There. I've added the Dating Lucy label so you can enjoy even more horrifying Betty and Veronica Lucy Lane dating horrors. Chris Sims once came up with a theory that even he doesn't believe, but if you allow yourself to buy it, almost explains Jimmy and Lucy. So Jimmy knows that Lois suspects Clark is Superman, and Clark behaves like the opposite of Superman as part of the act. So what if Jimmy assumes Supergirl is doing the same thing -- living under a secret identity, but rather than being her endlessly sweet self, behaves like the most vicious crone under the sun? Jimmy took one look at Lucy Lane, said to himself "jeepers, Supergirl sure is a good actress", and has been willing to tolerate the "fake" abuse ever since. Again, that notion doesn't withstand even casual scrutiny, but it's charming enough that I want it to hold up. Sure, because he was dating Lucy before Supergirl publicly came out, wasn't he? Although it is VERY interesting that the characters' first appearances are just a month apart (Lucy in April '59, Supergirl in May of that year). I think he probably put up with Lucy because he wanted to double date with his pal Supes. You bet! 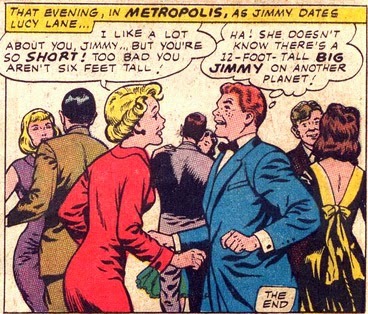 Jimmy and Lois may have had their own comics, but they were all about their obsession with Superman.